April | 2012 | Can't Believe It's Allergy Free! Make sure that kitchen counters are clean and clear of all allergy producing foods. Create allergen free areas by designating separate shelves in larders, and keeping specific counter spaces. If possible use a separate set of cooking implements such as knives, cutting boards, griddles, pans, woks, containers etc. Place all allergy free foods in containers with lids, and set them aside before handling other food. Label all allergy free food containers, and write dates, especially before freezing. Make sure that ‘wheat free is also gluten free’. Remember that it is best to prepare allergy free dishes earlier, so that they can be covered, set aside and protected from cross contamination. Cook extra portions of allergen free meals, so some portions can be frozen for later use. It is important to use utmost caution before introducing a new food. Some doctors suggest smearing the child’s cheek with the new preparation and leaving it on the skin for a while to check if it creates any redness, rash, itchiness or any other irritation. This is a good preliminary test. In any case, a new food item should be given in a very, very small quantity to begin with. A few hours observation is necessary before serving a larger portion. When its time for a Chinese’ Take-out’ dinner, there has to be a yummy alternative for anyone with allergies. The oriental sauce in this recipe is delicious, easy to make and can be combined with chicken, beef, pork lamb,, veggies—whatever you have in your freezer. 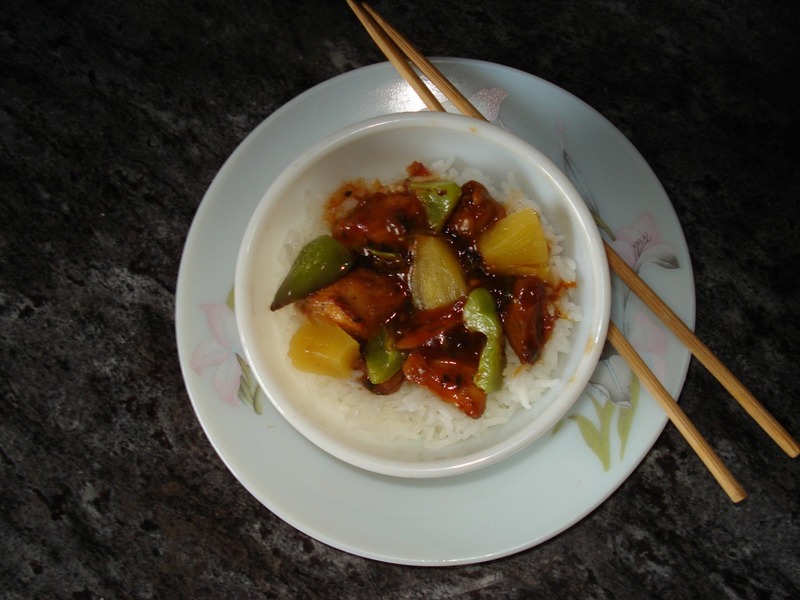 Before the dinner order reaches your doorstep, you can have this tasty dish ready for the child who cannot have Chinese restaurant food. Note Wheat is usually used in the fermentation of soy sauce. Gluten free soy sauce is available in some specialty stores, and can be used safely. If soy itself is an issue, skip using it. The sauce in this recipe tastes just as yummy without it. 2/3 cup diced, canned pineapple. 1/4 teaspoon salt or to taste. Heat oil in a heavy bottom skillet on low heat and stir in sugar till it caramelizes. Add chicken pieces and saute till coated. Drizzle a little water, cover and cook on medium heat, for about 5-7 minutes. Remove cover, add cut green pepper, and ground black pepper. Cover and cook for 3 – 5 minutes or till chicken is cooked. In a medium saucepan, combine all ingredients except chopped cilantro leaves and grated ginger. Lower heat, and stir in chopped cilantro. Place prepared chicken in serving bowl, and pour sauce over it. Garnish with grated fresh ginger root if desired. Freeze leftovers to pull out when time is short. Double the recipe and prepare for the whole family, as they will love it too! Serve this soup with a salad of your choice, and you have a great meal! Add potatoes and cook until tender. Drain and reserve liquid. Melt butter / heat oil in saucepan over medium heat. Add onion and cook stirring frequently till onion is soft and translucent but not brown. Add corn-starch mixture as soon as the potato-onion-liquid in saucepan comes to a boil, stirring all the time till soup thickens. Add sugar, cheese / soy cheese and ham. When soup is simmering, stir in 1/2 cup cooked quinoa for added nutrition, texture and taste.